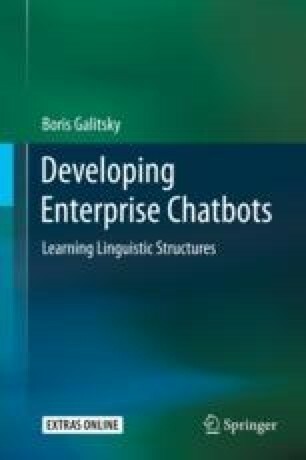 In the Introduction, we discussed that chatbot platforms offered by enterprises turned out to be good for simple cases, not really enterprise-level deployments. In this chapter we make a first step towards industrial–strength chatbots. We will outline the main components of chatbots and show various kinds of architectures employing these components. The descriptions of these components will be the reader’s starting points to learning them in-depth in the consecutive chapters. Building a chatbot for commercial use via data-driven methods poses two main challenges. First is broad-coverage: modeling natural conversation in an unrestricted number of topics is still an open problem as shown by the current concentration of research on dialogues in restricted domains. Second is the difficulty to get a clean, systematic, unbiased and comprehensive datasets of open-ended and task-oriented conversations, which makes it difficult for chatbot improvement and limits the viability of using purely data-driven methods such as neural networks. We will explore the usability of rule-based and statistical machine learning - based dialogue managers, the central component in a chatbot architecture. We conclude this chapter by illustrating specific learning architectures, based on active and transfer learning.